I wondered, why couldn’t we live that way with mutual respect for one another’s identity and uniqueness? ‘This is my section,’ said my nephew while he made an invisible line with his finger ‘…and that’s yours,’ as he pointed to ‘my side’ of the bed. ‘Ok, darling. I will try my best to only sleep on my side and not come into yours.’ I said as I kissed him goodnight. His my-side-your-side invisible border reminded me of an email I received sometime ago about Oceanography, a study of earth’s ocean and sea. In the email, it was said that in the southern part of Cape Town, South Africa, we could see two different rivers flowing together where one river is sweet and the other is salty. So, what is so special about them? These rivers were flowing together all the way to the ocean and miraculously; the two rivers did not even mix! They continue to flow in that same state until both reached the sea. And we could still see from the sea the two different distinct characteristics of the two river! 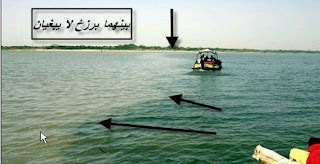 Allah has said that He has created two seas which are situated side by side, next to one another, but they do not mix as He has set a barrier between them. SubhanAllah, this is amazing, right? A wish that we human being, said to be the best of creations, could learn from the sea barrier one lesson in life: lesson of respecting others’ uniqueness. Just look at how they ‘respected’ the boundaries that set them apart from one another, to each is their own unique characteristics. Still, they are able to move towards the ocean side by side, together, harmoniously! I’m not concerned with your liking or disliking me . . . All I ask is that you respect me as a human being. She was right, don’t you think? I wondered, why couldn’t we live that way? With mutual respect for one another’s identity and uniqueness; without forcing the other person to change and take after the characteristics we have? Why do I have to be like you in order to be accepted? Do you like it if I demanded that you become like me, so that I could accept you? Why couldn’t we let people just wear what they prefer to wear? Be it covering their hair, their faces and their bodies? Why do we have no respect for the preferences of another being? I still am confused of why couldn’t people simply celebrate the joy others have when eating their uncooked fish, or spicy curry, or hot chilly dish, or burger and chips, or their ‘upside-down’ dish; without thinking oddly of them?